What you see in the current period is a quite different—a massive decline in driving over the downturn with little uptick since. 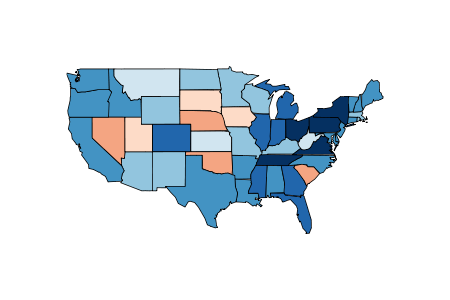 Again, both high unemployment and high [gas] prices are in play here, so there may be a bounce back out there once the economy gets back on track. But it bears watching—there may be a new behavioral response in play, with people’s driving habits a lot more responsive to these economic changes than they used to be. Ok, but what’s the big deal? Well, I’ve generally been skeptical of arguments about “the new normal,” thinking that much of what we’re going through is cyclical, not structural, meaning things pretty much revert back to the old normal once we’re growing in earnest again. But it’s worth tracking signals like this that remind one that at some point, if it goes on long enough, cyclical morphs into structural. What could explain this cultural shift? Maybe more young people are worried about the price of gas or the environment. But—and this is just a theory—technology could play a role, too. Once upon a time, newly licensed teens would pile all their friends into their new car and drive around aimlessly. For young suburban Americans, it was practically a rite of passage. Nowadays, however, teens can socialize via Facebook or texting instead—in the Zipcar survey, more than half of all young adults said they’d rather chat online than drive to meet their friends. But that’s all just speculation at this point. As Bernstein says, it’s still unclear whether the decline in driving is a structural change or just a cyclical shift that will disappear once (if) the U.S. economy starts growing again. Is it really plausible to posit this kind of cultural shift, particularly given the evidence about the price elasticity of oil? As it happens, I did a bit of analysis on this point a couple of years ago. 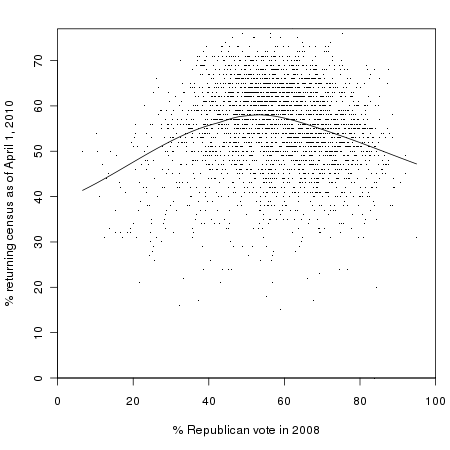 Back then, Nate Silver wrote a column in which he tried to use a regression model to address this question of whether the decline in driving was a response to economic factors or an indication of a cultural trend. Silver argued that economic factors–in his model, unemployment and gas prices–couldn’t completely explain the decline in driving. 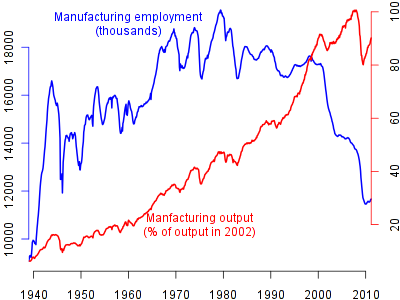 If true, that result would support the “cultural shift” argument against the “cyclical downturn” argument. The blue line is the 12-month moving average of Vehicle Miles Travelled–the same thing Bernstein posted. The green and red lines are 12-month moving averages of predicted VMT from two different regression models–the Nate Silver model and my expanded model, as described in the earlier post I linked. The underlying models haven’t changed since my earlier version of this graph, except that I updated the data to include the most recent information, and switched to the 10-city Case Shiller average for my house price measure, rather than the OFHEO House Price Index that I was using before, but which seems to be an inferior measure. 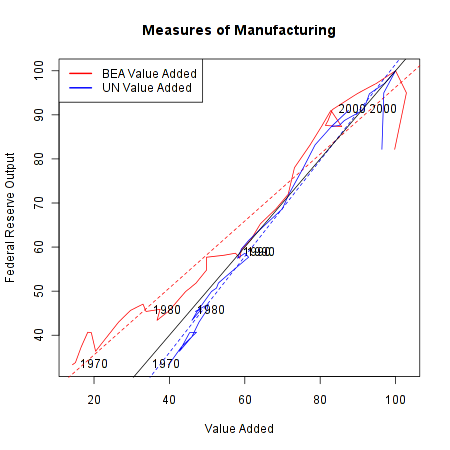 The basic conclusion I draw here is the same as it was before: a complete set of economic covariates does a pretty good job of predicting miles traveled. In fact, even Nate Silver’s simple “gas prices and unemployment” model does fine for recent months, although it greatly overpredicts during the depths of the recession. * So I don’t see any cultural shift away from driving here–much as I would like to, since I personally hate to drive and I wish America wasn’t built around car ownership. Instead, the story seems to be that Americans, collectively, have experienced an unprecedented combination of lost wealth, lost income, and high gas prices. 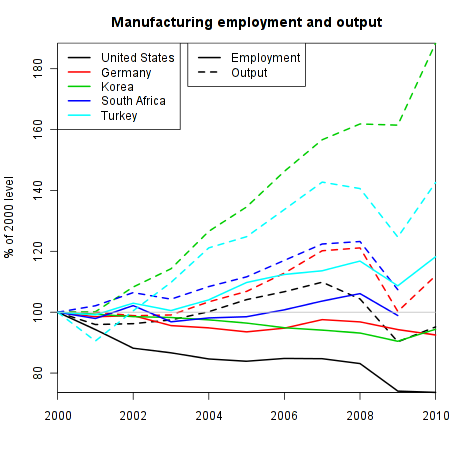 That’s consistent with graphs like these, which look a lot like the VMT graph. The larger point here is that we can’t count on shifts in individual preferences to get us away from car culture. The entire built environment of the United States is designed around the car–sprawling suburbs, massive highways, meager public transit, and so on. A lot of people can’t afford to live in walkable, bikeable, or transit-accessible places even if they want to. Changing that is going to require a long-term change in government priorities, not just a cultural shift. Below are the coefficients for my model. The data is here, and the code to generate the models and graph is here. * That’s important, since you could otherwise argue that the housing variable in my model–which has seen an unprecedented drop in recent years–is actually proxying a cultural change. I doubt that for other reasons, though. 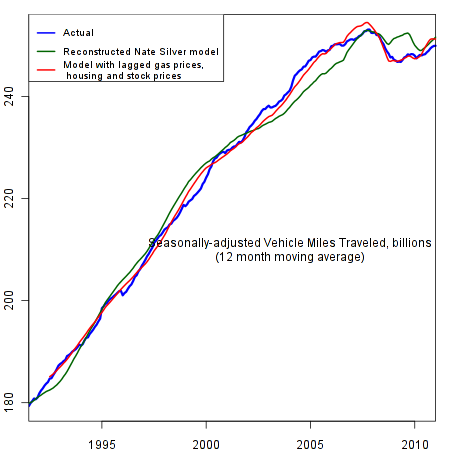 If housing is removed from the model, it underpredicts VMT during the runup of the bubble, just as Silver’s model does. That suggests that there is some real wealth effect of house prices on driving. Last week, Seth Ackerman wrote a Jacobin blog post in which he gave us a snarky attack on the record of “left neo-liberalism” in the United Kingdom. Basically, he showed that while New Labour managed to reduce poverty somewhat with cash transfer programs, the progress was meager and could not be sustained. Since the programs were financed out of a series of asset bubbles, the UK has seen poverty go back up again with the recent crisis. First, you embrace the standard globalization model of reduced or eliminated tariff walls, large free trade agreements such as NAFTA or CAFTA, deregulation, and general trade liberalization. This encourages international trade and the exporting of jobs from highly-regulated, fairly well compensated, high worker standard of living places like the United States to the cheap labor, low regulation, low worker standard of living places like China or Indonesia. This spurs international economic growth in both the exporting and importing countries. Here at home, higher growth results in higher tax revenues which can then be redistributed from those at the top of the income distribution (who have benefited from the globalized trade regime) to those at the bottom of the income distribution (who have been hurt by the globalized trade regime that undercuts their wages and exports their jobs). I think that if you want to really criticize this view, you need to look beyond the UK, which is neither a very generous nor a particularly well-designed welfare state. As it happens, my day job involves analyzing cross-national income data, so I’m going to perpetrate some social science on y’all. The way I read the “globalize-grow-give” critique, you can extract an empirical claim about how the income distribution should look in a G-G-G economy. The distribution of income before taxes and transfers will become increasingly unequal due to deregulation and globalization, but the distribution after taxes and transfers are accounted for will not become vastly more unequal because government is compensating for the inequality in the private market. 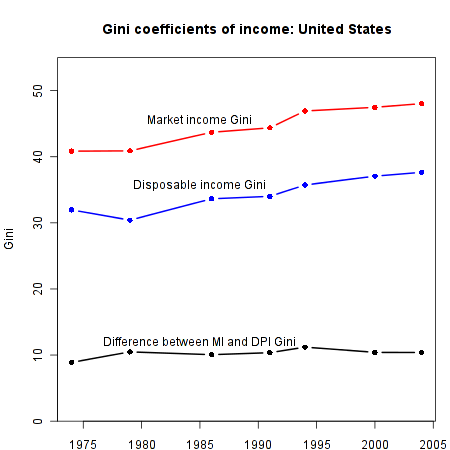 The Gini of market income. Market income is defined here as income from wages, pensions, self-employment and property. 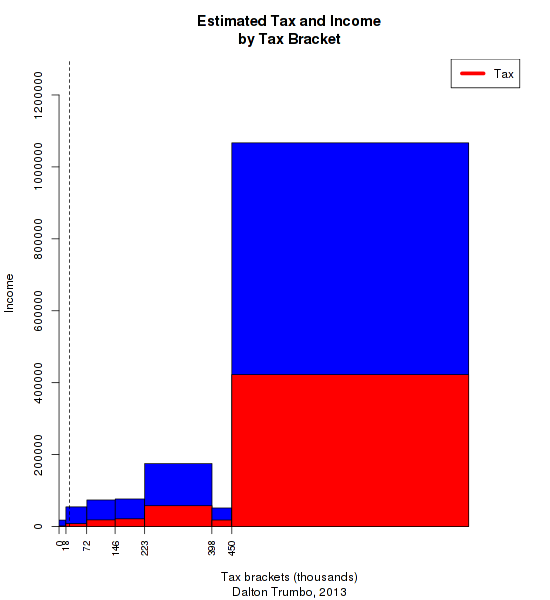 This is income before any taxes or transfers are accounted for. 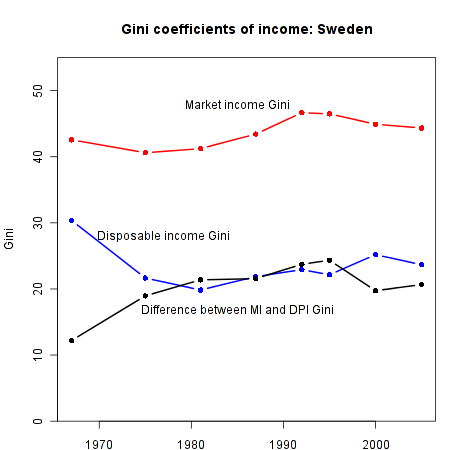 The Gini of disposable income. 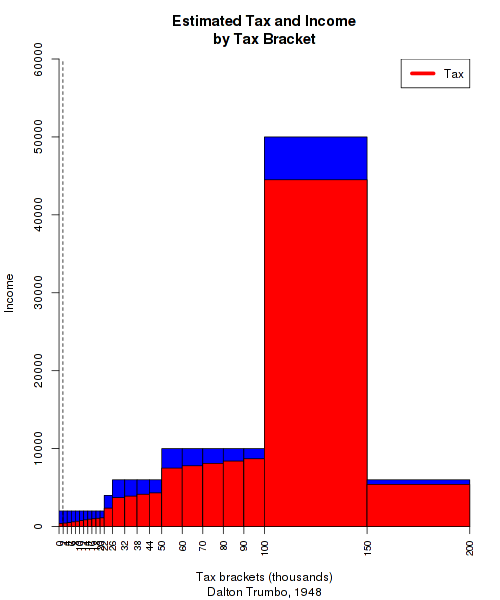 This is the income that people actually have to spend, after taxes are deducted and any transfers are added in. (For more details about the variables, see the postscript). Unfortunately, the difficulty of harmonizing cross-national data means that the numbers I have access to are a bit out of date–specifically, they end before the current crisis period. I still think we can learn something useful from them, however. 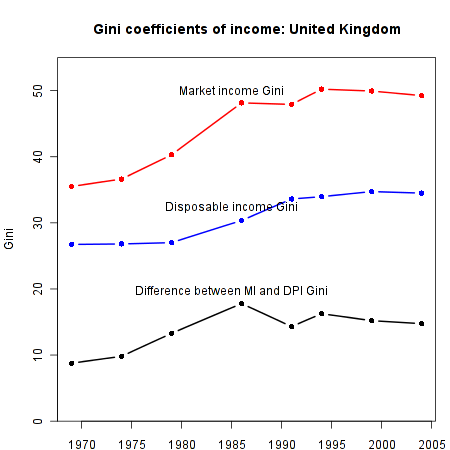 The way G-G-G neoliberalism is supposed to work, the Gini of market income should go up but the Gini of disposable income should not–or at least should rise more slowly. We can think of the difference between market income inequality and disposable income inequality as a rough measure of the amount of redistribution done by the state. Here we see something very interesting. 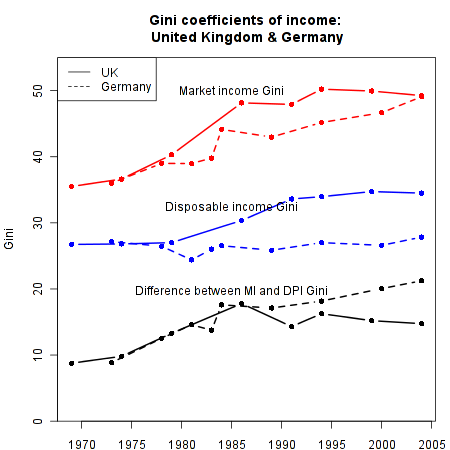 Before you take taxes and transfers into account, the rise in inequality in Germany looks very similar to what happened in the UK–indeed, the two countries converge to almost the same value by 2005. But disposable income inequality has stayed flat in Germany, because the German state has used taxes and transfers to counteract rising inequality. Here the story is a bit different–both market income and disposable income inequality have remained pretty flat, although both have risen a bit. The important thing to note here is that even in the most socialist of welfare states, market income inequality is very high, nearly as high as it is in the UK or US. The fact that Sweden is one of the least unequal countries on earth has to do almost entirely with taxes and transfers. So what can we conclude from all this? Let me be clear that I don’t think this is a knock-down argument in favor of “globalize-grow-give” as a political model. But I think the best argument against the G-G-G model is not that it’s economically impossible or dependent on asset bubbles. Rather, I’d point us back to the political arguments enumerated by me, Henry Farrell, and Cosma Shalizi among others. 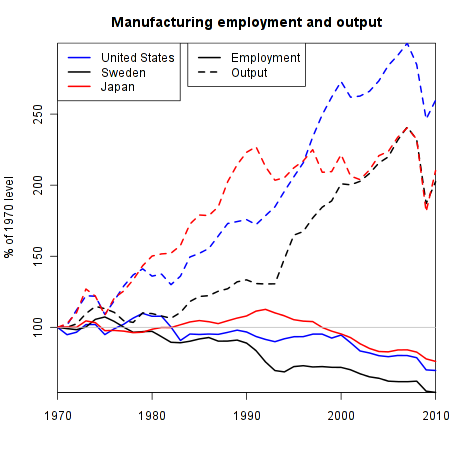 What makes Sweden and Germany different is not that their economies are different from those in the US and UK (although they are), but that they have different political environments, featuring things like a hegemonic Social Democratic party in Sweden and a strong labor movement in Germany. So if left-neoliberalism is to be a workable political agenda rather than the motto of useful idiots for the “globalize-grow-keep” agenda of the right-wing neoliberals, it has to either make its peace with the sources of working-class power that currently exist, or else come up with workable models of what might replace them. [Postscript for income inequality nerds only: the income variables are equivalized for household size using the square root of the number of persons in the household as the equivalence scale. The variables are then topcoded at ten times the equivalized mean and bottom-coded at 1 percent of the equivalized mean. Note that the transfers included in disposable income are only cash transfers and “near-cash” benefits (like food stamps), not in-kind services like health care. 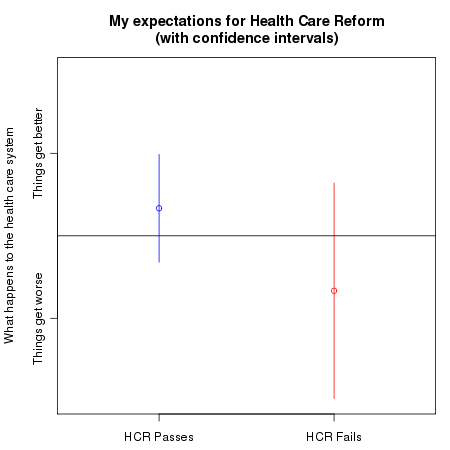 So you could argue that this data actually understates the extent of redistribution. Click for a bigger version, but the gist is that the red line indicates the phrase “higher wages”, and the blue line is “shorter hours”. Higher wages have a head start, with hours not really appearing on the agenda until the late 19th century. That’s a bit later than I expected, but it’s generally consistent with what I know about hours-related labor struggle in the 19th century. 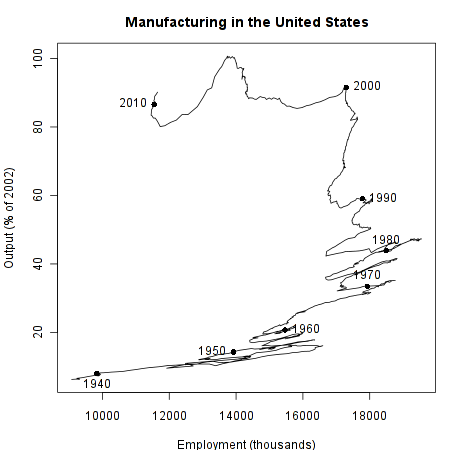 The 20th century is the more interesting part of the graph in any case. For a while, it seems that discussion of wages and hours moves together. They rise in the period of ferment after World War I, and again during the depression. Both decline during World War II, which is unsurprising–both wage and hour demands were subordinated to the mobilization for war. But then after the war, the spike in mentions of “higher wages” greatly outpaces mentions of “shorter hours”–the latter has only a small spike, and thereafter the phrase enters a secular decline right through to the present. Interest in higher wages appears to experience a modest revival in the 1970’s, corresponding to the beginnings of the era of wage stagnation that we are still living in. But for the first time, there is no corresponding increase in discussion of shorter hours. This is again not really surprising, since the disappearance of work-time reduction from labor’s agenda as been widely remarked upon. 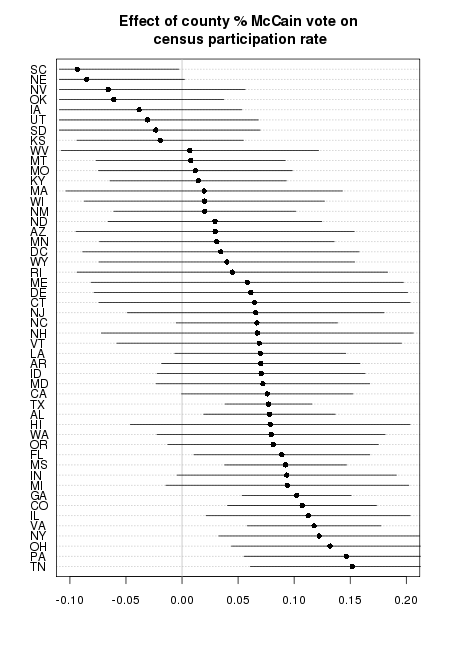 But it’s still pretty interesting to see such evidence of it in the written corpus. This could be cleaned up to deal with the overlapping names, and additional information might be useful (such as the average globalization score of all countries in each year, and the maximum and minimum scores), but I think this is pretty informative. 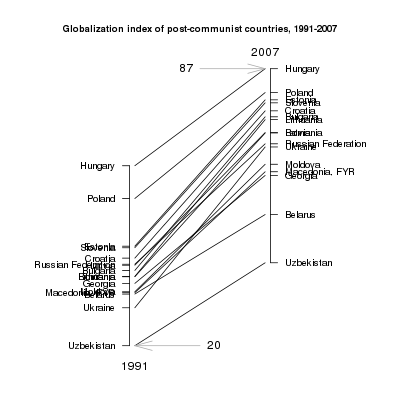 You can see the overall political and economic integration of these countries into the capitalist world, for example. There’s also the increasing distance between the main cluster of countries on the one hand, and the insular autocracies of Belarus and Uzbekistan on the other.